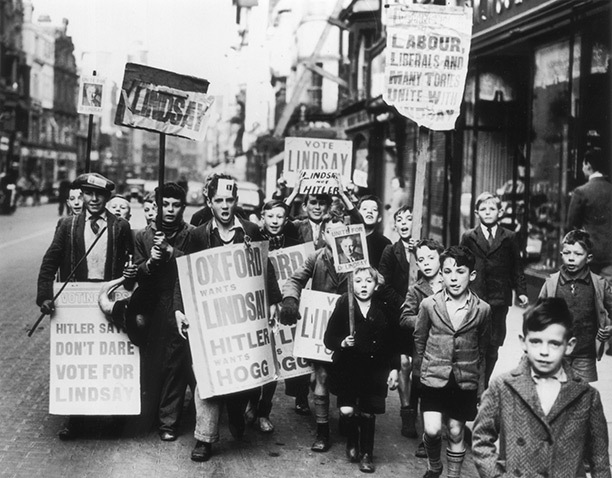 The Oxford by-election of October 1938 became a referendum on the Munich Agreement of the previous month. As such it was watched closely by Roosevelt, Mussolini and Hitler. Christopher Farman describes the event. In the early hours of September 30th, 1938, the British prime minister Neville Chamberlain, the French premier Edouard Daladier and the Axis dictators, Hitler and Mussolini, signed the Munich Agreement, requiring Czechoslovakia to hand over its mainly German-speaking border region of the Sudetenland to the Third Reich. Hitler, who had been threatening to go to war over the territory, was now awarded his prize without firing a shot and Chamberlain and Daladier flew home to rapturous receptions. ‘No conqueror returning from victory on the battlefield’, proclaimed The Times on October 1st, ‘has come home adorned with nobler laurels than Mr Chamberlain from Munich yesterday.’ The profound sense of relief that war had been averted was shared even by critics of the agreement. One such was Harold Macmillan, the Tory MP for Stockton. His son ‘would stay at school and go to Oxford in the autumn ... my home and children, like all the other homes and children throughout the country, would be spared – at least for the time’.